The settings dialog contains multiple tabs with specific settings under each one. This page describes the General settings tab. This drop down allows you to choose the units used to display speed values throughout the application. The options are KPH or MPH. This drop down allows you to choose the units used to display fuel amount values throughout the application. The options are liters or gallons. This drop down allows you to choose the units used to display pressure values throughout the application. The options are kPa/Bar or PSI. This drop down allows you to choose the units used to display temperature values throughout the application. The options are celsius or fahrenheit. This drop down allows you to choose the units used to display distance values throughout the application. The options are meters or feet. This drop down allows you to choose the units used to display weight values throughout the application. The options are kilograms or pounds. This drop down allows you to choose the units used to display torque values throughout the application. The options are newton-meters or foot-pounds. When scanning for laps the Analyzer looks for full laps only. However sometimes due to the fidelity of the lap data that some sims report, the starting position reported by the sim might not be exactly at zero. So by allowing a slight variable in the start location the Analyzer can read all generated laps. The default variance is 5%. A setting of 5% means that the lap has to start somewhere between the start/finish line at 5% of the way round the lap. If you find some of your laps are not being read then try adjusting this variable to a higher number. When scanning for laps the Analyzer looks for full laps only. However sometimes due to the fidelity of the lap data that some sims report, the ending position reported by the sim might not be exactly at 100% of the lap. Alternatively some tracks, such as the Nurburgring Tourist configuration, have the end of a timed lap before the end of the physical lap on track. So by allowing a slight variable in the end location the Analyzer can read all generated laps. The default variance is 95%. A setting of 95% means that the lap has to finish somewhere between 95% and 100% of the lap. If you find some of your laps are not being read then try adjusting this variable to a lower number. This is the maximum number of laps that will be returned from the server for display in the open lap dialog. A larger number may results in more available laps in the dialog, but can also slow the application down. This determines which laps are returned if there are more laps available on the server than the MaxDwnld Lap setting above. Most Recent will choose the most recently uploaded laps. Fastest Lap will choose the fastest laps. This determines the units to be used on the X axis of the traces. The options are Lap Time, Lap Percent, and Lap Distance. This is the maximum age of a lap file in months for it to be included in the scanned laps. This allows you to reduce the number of laps in your database to just the current ones. This allows you to specify which throttle and brake traces are used in generating the throttle/brake overlays on track maps. You can choose Filtered or Raw. Filtered includes all electronic inputs, such as auto blips, etc. Raw is the exact position of the pedals, regardless of what the engine electronics may be doing to the inputs. This allows you to select form the various debug options. In general this should be set to Off unless you are trying to debug a problem with the application. The debug data is stored in the log files located in documents/z1analyzer/logs. This is the speed in MPH that is used in the Brake Lockup analysis screen to determine if the front wheels are locked up or not. If the difference in wheel speed between the front and rear wheels is great than this amount then the front wheel are considered to be locked up in the analysis screen.. This is the width of the track when it is drawn in the various track maps. This is the diameter of the dot representing your car when drawn on the various track maps. With this checkbox ticked the application will maximize the window upon starting. With this checkbox ticked the application will scan for new laps every time it starts. If you uncheck this box, then you can tell the Analyzer to scan for laps when you are in the Select lap Dialog. With this checkbox ticked the application will remember the location of the window when you close it. The next time you open the window (assuming it isn't maximized) the window will position itself at that location. With this checkbox ticked any trace graph that could start at a level of zero will do so. For example if the car has a maximum RPM of 8000, with this box ticked the trace will display a graph from zero to 8000. If you untick the box then the lower value of the graph will correspond to the lowest value actually used in the trace. For example if your car has a maximum RPM of 8000, and during the lap the RPM ranges from 5000 to 8000 then the trace graph would go from 4000 to 8000. This allows you to have more detailed displayed in the trace. With this checkbox ticked the Z1 Analyzer will remember the currently loaded lap and reload it the next time you open the application. With this checkbox ticked the Z1 Analyzer will determine the turns on the track by using the track edges if they are available. This usually produces better results than the previous method used (by analyzing the car's telemetry) to determine if it was in a turn.) If the track edges are not available or this box is unticked then the old style of telemetry analysis to determine the turns will be used. If you are using iRacing and have the Analyzer running on the same machine as the sim and the lap you are analyzing is one that has just been run in the current iRaving session, then checking this box will tell the Analyzer to attempt to play back the replay of the lap in sync with the movement on the traces. If this option is selected then the Analyzer will remember the location and sizes of the traces when you open it. If you uncheck it then the default locations will be used when the Analyzer is opened. The rFactor and rFactor 2 sims do not provide accurate enough positions through out the lap for all of the Analyzer's analysis functions to work smoothly. If this option is selected the Analyzer will fill in the gaps with data based on other inputs creating a smooth movement throughout the lap. When you open a lap the Analyzer will check to see if you have track edge files for the track available. If you do not and this option is selected then the Analyzer will attempt to connect to our servers and download the track edge files if they are available. Having track edge files available makes many of the analysis screen much more useful. This checkbox determines if sector boundaries are drawn on the traces and track maps. This is on by default. This checkbox determines if markers placed in the telemetry file are drawn on the traces and track maps. This is on by default. 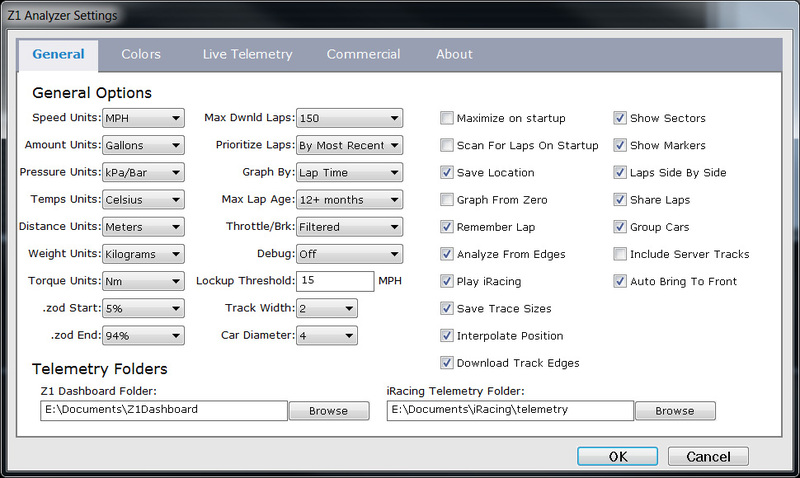 This checkbox determines if the Analyzer will render both loaded laps side-by-side on the speed comparison analysis screen. This is on by default and allows you to view the throttle and brake inputs overlayed on the track map for easy comparison. When this is selected any laps that you open will be uploaded toi our servers so other users cna download them and compare them against their own laps. It also allows you to download laps from our servers to compare your laps against. If this option is turned off then your laps won't be shared, and you won't be able to download laps from our server. When this option is selected the laps displayed in the open lap dialog will be grouped together by the car make. The list of tracks available in the Track drop down in the Open Lap dialog is based on the laps you have driven. If this option is selected then that list will also include any tracks from laps that others have driven that are available on our servers. This allows you to view and download laps from tracks that you have not yet driven on. Note you must also have the Share Laps option selected for this to work. If this is selected then whenever you click on a trace oin the Analyzer that trace will be brought to the foreground. This is the path to your Z1 Dashboard folder in your documents folder. The application should automatically set this. However if you need to change it click the Browse button to do so. In order for the application to load the iRacing ibt files it needs to know where they are located. The application will assign the default iRacing folder. However if you use a different folder to store your iRacing ibt files then you can change this location by clicking the Browse button.